As a sequel to my previous Huffington Post article, Are Families Ready for The Death And Dying Conversation, this one talks about the approaches health care providers can do to help them make informed choices. Since individuals and families put off the death and dying talk, The Institute of Medicine (IOM) suggests that health care providers need to normalize the high emotions that accompany the subject matter. However, the sooner one discusses their preferences and documents them, the result could be an improved experience during a catastrophic medical event. It's an opportunity for every family member to exercise the right to have their choices followed. By doing so, an individual will avoid the unwanted treatments that may extend life but not necessarily give them the quality to enjoy it. What strategies do you use to inspire end of life and estate planning conversations? It's part of our care assessment process and ongoing work with every individual. Community education is also important to create awareness and discussion. The owner of our company, Elder Law Attorney Linda Chamberlain, often offers seminars on topics like "Generating an Exit Strategy" and "The Legal Docs You Must Have." Shannon Martin, AgingWisely.com. As a home health agency, Florida requires us to ask each patient about Advance Directives. However, we feel it's a valuable resource to refer clients to elder law attorneys and other professionals who can deliver comprehensive care management. We offer education through our blog and other outreach. Alex Chamberlain, EasyLivingFL. I suggest that family caregivers start early with loved ones by easing into the conversation and involving siblings when possible. I stress the importance and when needed the consequences of not planning. But you have to start when at the point in life when you are least worrying about the issues because one thinks he will be around for years! Life is short. Plan early. Anthony Cirillo, The Aging Experience. We assist them to voice their concerns, like potential family discord, tough questions about death, end of life care, creditors and taxes. We explain that it will help protect their loved ones, make their wishes known, put them in charge of their finances, and that lack of action will benefit the IRS. Discussions may lead to further family closeness, and is essentially a love letter to loved ones. Ben Mandelbaum, Senior-Planning.com. In conversations with clients, I reference The Conversation Project. They offer free tools to consumers. (www.theconversationproject.org) Their Starter Kit is an easy, painless way to open the door to end of life. Use it before creating the advance directives. It helps individuals to think through the medical interventions before speaking with a lawyer. Laurie Miller, Apple Care and Companion. As a client ages, they spend time thinking about what it is they want to leave behind. More and more people, even those who are non-religious, are exploring their spirituality and arrive with a realization that there is much more to life. It's why I emphasize Ethical Wills, to convey values, spiritual/religious beliefs, and life's lessons. Evan Farr, Farr Law Firm. We help families understand the advantages of planning for end-of-life as well as the sometimes harsh consequences of not planning ahead. These are tough conversations to have, so we share advice on how to discuss the subject in ways that seniors are likely to accept. We also highlight personal stories from experienced caregivers who've learned valuable lessons about end-of-life planning. Connie Chow, Daily Caring. When advising a new client, I find that legal services early on resolves the sensitive issues. Further, this allows me to determine which legal documents to put in place first. And then move on to how to distribute the property. David Mordehi, Advise and Protect. I recently authored a guide, RightConversations; it walks caregivers through active conversations about the care preferences, how to involve siblings, and how to plan for the future. You may also find the Helping Financial Caregivers in Every State guides useful. Dr. Eboni Green, Caregivers Support. Sharing personal experience and challenges on my family's estates and advance directives is the most efficient way to start a conversation with another person. It illustrates the reality of the issues. I use a matter-of-fact approach and give practical tips (as I do in my book "Juggling Life, Work and Caregiving"). Amy Goyer, AARP, and Amy Goyer. 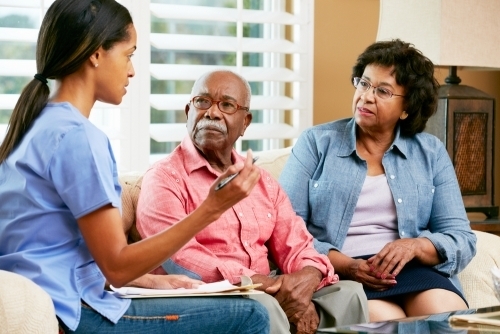 Have you had the advance care planning discussion with loved ones? Share your story, tell us how your loved ones handled the tough topic? What did you do to prepare them for it?